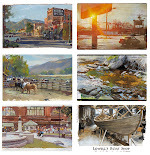 Blog reader Sean Oswald asks: "I was exploring some narrative artworks, and I wanted to ask if you would point me towards some resources that would help me learn about narrative art making. I want to know more about story and how it has been used in visual art to communicate ideas. I would also like to learn more about the pictorial mechanics of telling stories and the science behind it." Sean, I think this is an important question. I wish there was more written about this, and I think it's a fertile field for study. Most of what's been written about the topic by art historians so far has been dismissive and short-sighted, usually by people who don't really create storytelling pictures. To understand the science behind how we look at storytelling pictures, I would love to see a researcher combine eyetracking data with fMRI brain scans in real time to see what's going on in the brain as a person begins to decipher a picture. Do the mirror neurons fire when you see a picture of a person doing a certain action? Can you actually see the brain engage on different levels as the visual processing moves from lower to higher levels? Here are a few thoughts on the topic. 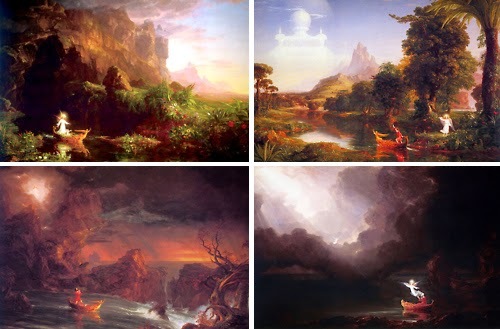 There are some famous series of paintings such as Thomas Cole's "Voyage of Life" that tell stories with a beginning, middle, and end, almost like a painted graphic novel. The Catholic church has told many Bible stories sequentially in stained glass windows and altarpieces. But let's consider single-image story-paintings, and let's begin with semantics. People often call them "illustrations." But I don't really like that term because it's misleading. Some paintings don't illustrate a text—they can stand entirely on their own, just as a play or a movie would do. 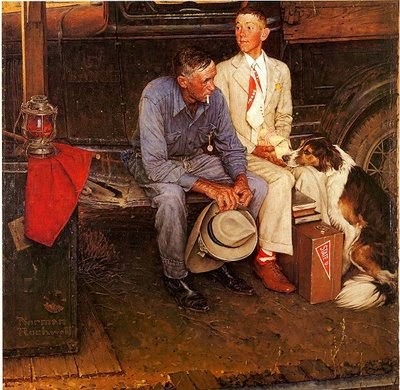 In that sense, Rockwell's Post covers aren't illustrations, even though they're some of the finest examples of storytelling pictures. As I mentioned in a post called "Detective Storytelling," I also have difficulty with the term "narrative art" because a true narrative requires the presentation of a series of events, revealed in sequence (First A, then B, then C). In a single picture, unlike a graphic novel or an animated film, all the events are telescoped into a single moment. Previous moments or events are implied by clues, and the subsequent moment can only be suggested. We might better describe this kind of art as a “detective storytelling.” It demands effort from the viewer to find all the clues, and care from the artist to make sure not to clutter the scene with extraneous detail. 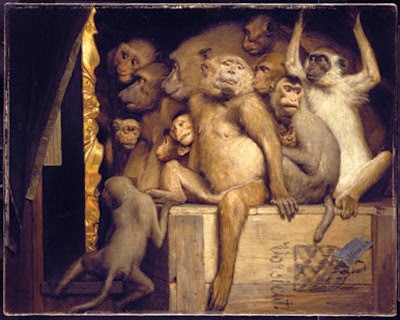 Several books have been written about Victorian Narrative Painting . It's a big subject with a lot of wonderful examples. 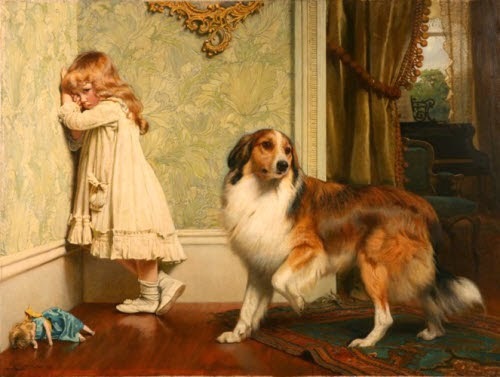 For example, in this painting by Barber, the dog's characterization shows its conflict of loyalties, and the picture hints at the tantrum the girl threw before she was punished. As a final thought, I believe it's possible for a painting to tell a story without human figures at all, as long as the painting implies a series of events that preceded the moment depicted. 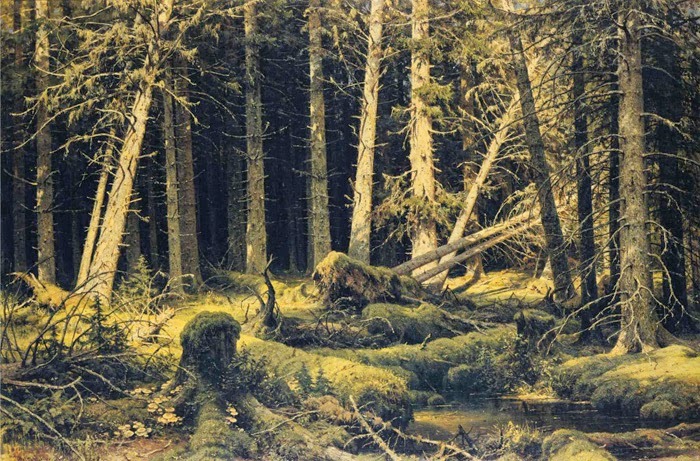 Shishkin's forest paintings often describe the story of the forest by presenting evidence of past storms and woodcutters. Detective Storytelling and Before the Judge (Analyzing two academic paintings). 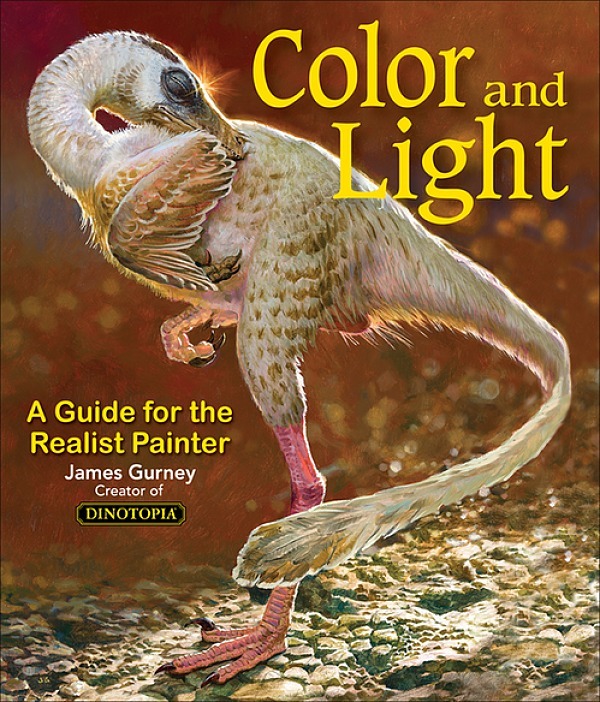 Thoughts on stories in illustrated books such as Dinotopia. When I think about telling a story with pictures, I always think about Disney animator Marc Davis (https://d23.com/marc-davis/) who had a special knack for creating a "frozen" moment in time that was forever on the verge of bursting into life. His best known work are the Disneyland rides such as Pirates of the Caribbean. Thank you. These articles are very helpful and thought provoking. I've thought about this before when you've posted on the topic, but the joys of piecing together the narrative behind a painting (as described in "Detective Storytelling") remind me of the puzzle you get from some single-panel cartoons that don't have a caption - I'm thinking Gary Larson here. Cartoons can set up a strange situation, and require the reader to figure out what happened - often some hilarious reversal of a normal narrative. Cartoonists obviously are trying much harder to guide the readers to reach the conclusion (which is the joke), but you get the same sudden thrill when things fall together. This may not fit but here is a painting I just did that tells a story. Any devotee' of bird hunting/dog training would see this and the title "Mixed Double" and begin to figure it out. I added text for newcomers to the sport but it tells a story that can be expanded into multiple scenarios, in my view. James, it this isn't what you had in mind just hit the 'Delete' button. I enjoy your blog to no end! Please get that casein video finished. I am ready to go with it, and my first try at oils, after watercolor work for over 15 years. Thanks. Very cool application of the "narrative" to the Shishkin painting. Something I hadn't really thought of in his work, but perhaps, only sensed it as an "inner strength". Great to see that Gabriel von Max painting! I never heard of him until seeing this painting in person in Germany, and it blew my mind. Everything works, including the narrative. Thanks Jim! This is awesome and super helpful. I just got the Andrew Loomis book from the Library the other day and have been reading through it. It is quite fantastic.